Fresh Louisiana crude washed into the beaches and dock areas near Grand Isle over the weekend, creating a sickening sight for the residents of this oil battered region. 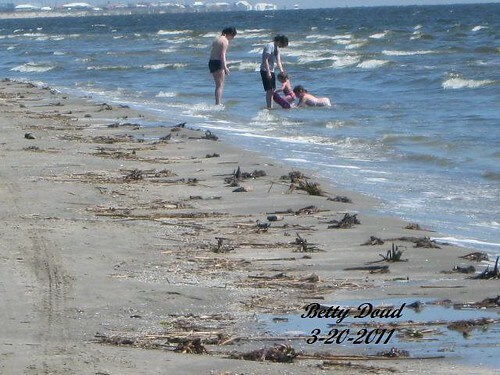 The reddish brown crude and oily sheen lapped onto the sandy and rocky shores, while some people flocked to Grand Isle's famous white beaches for spring break unaware of the oily assault nearby. Grand Isle Mayor David Camardelle said the oil had hit Elmers island and Lafourch beaches near the main beach area of Grand Isle. He said the oil appeared to be about two miles offshore over the weekend but then started coming ashore to the west of the island. "It reminded me of the first time we saw oil last summer, a brown reddish sheen." The Coast Guard says it is mobilizing workers to lay fresh boom in environmentally sensitive areas and arranging for additional cleanup crews to help as oil comes ashore. The Coast Guard said the oil appears to have come from a leaking drilling rig near Grand Isle, but details remain sketchy. News reports quote local government officials as saying the oil spread for 5 miles. The Coast Guard is continuing its investigation of reports last weekend of a major plume of oil in the Gulf that stretched for perhaps a hundred miles, according to reports filed with the Coast Guard's emergency response office. A Coast Guard press release yesterday stated the giant dark plumes in the water appeared to be a massive dredging operation in the Mississippi River that had washed silt into the Gulf. The agency said it had sampled the water from the plumes that could be seen from the air and found only "trace amounts" of petroleum hydrocarbons, oil and grease. But others who flew over the area last weekend believe there were vast stretches of oil in the water. Mike Roberts of the Louisiana Bayoukeepers was with a group that went up in the air on Saturday and then out on a boat on Barataria Bay Sunday. "It looked like a huge amount of oil in the Gulf," Roberts said. "They could smell it from the airplane and I could smell it from the boat. This wasn't just Mississippi River mud." We turned to the southwest, heading toward the reported oil sighting south of Grand Isle, LA. Almost immediately we began seeing, what appeared to be, large areas of oil just below the surface along with streaks of multicolored "sheen" on the surface. The smell of petroleum was thick in the air. We flew southwest, to approximately 40 miles south of Grand Isle and followed the "plumes" and "sheen" north all the way in to Grand Terre Island and Grand Isle. The "sheen" appeared to be flowing into Barataria Bay through Four Bayou Pass and Grand Isle Pass. We saw only a few birds, one large, dead Red Fish and only three dolphins during the entire fly over. "There were dolphins and turtles and a large bull redfish lying dead on its back... They worked for a full 20 minutes trying to push this other one up, and eventually I guess they gave up." Coast Guard officials say they will continue to investigate the source of the leaking oil and complete tests results of water samples taken from the giant plumes observed last weekend. As the memorial anniversary of the BP blowout approaches, this is one memory coastal residents here don't want to live through again.